Meet Digiperformer Bhavya Saxena, who is working as a Digital Marketing Trainer at Guru Nanak Dev Institute of Technology; just after completing her dCDMC training at Digiperform. 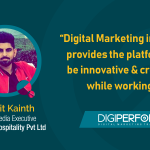 In chit-chat session, she has shared how Digiperform’s advanced digital marketing training program helped her to understand the concept of online marketing and trained her to follow her training career. Bhavya– Hi, I am Bhavya Saxena, currently working as a Digital Marketing Trainer at Guru Nanak Dev Institute of Technology. Bhavya– Digital Marketing is one of the booming industries in India. It’s a very creative field, and it’s going to be our future now! Every business sooner or later will be dependent on it. Bhavya– Being a Digiperformer, I have seen the syllabus and the course and it’s very informative which covers every detail and topics right from the basics. We have been provided 24X7 access to LMS that contains all the study material and test papers which makes it better than other institutes. Bhavya– All the classroom sessions were fun, post-college, learning was never that easy. The trainers were very helpful and taught us in a very easy to learn way. Bhavya– Yes, with the helpful and cooperative staff around, it’s safe to say that Digiperform is a trusted and reliable resource. Bhavya– I see myself as a known Digital Marketing Trainer and Influencer in some good institutions of India. Digiperform-Finally, Describe Digiperform in one line. Bhavya– The perfect place to imbibe the complete knowledge in Digital Marketing. Thanks Bhavya for being the part of Digiperform family.